Early one morning last June, pilot André Borschberg stepped aboard an odd-looking plane — its wings long like those of an albatross, its cramped cabin as small as a refrigerator — and guided it into the sky above Japan. In a typical airliner, it would have taken him eight hours to arrive at his destination in Hawaii, but Borschberg was at the helm of Solar Impulse 2, a plane powered entirely by the sun’s rays. Lightweight but slow, traveling at an average of 38 miles per hour, it landed in Hawaii after 117 hours 52 minutes, or five days and five nights — the longest solo flight in history. 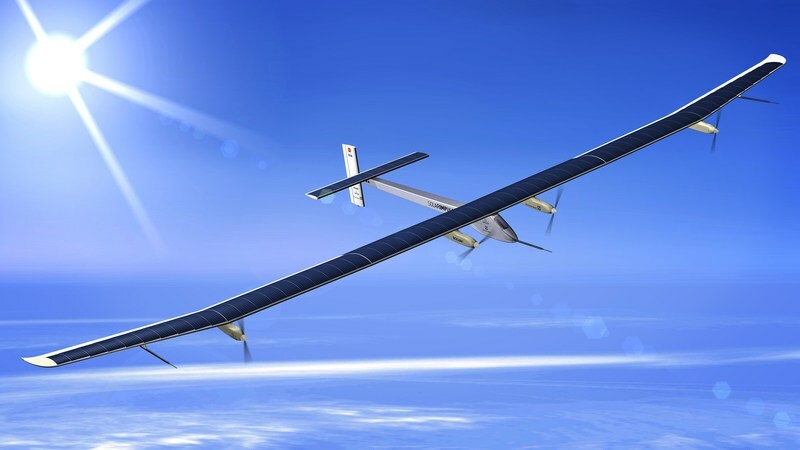 Borschberg, 63, and fellow Swiss pilot Bertrand Piccard, 58, were in the middle of attempting the first round-the-world trip in a solar-powered plane, taking turns at the controls of the single-seat aircraft. They left Abu Dhabi, capital of the United Arab Emirates in the Middle East, in March 2015, and have divided their trip into 13 segments. The flight from Japan to Hawaii was the longest and most dangerous. On the first day, a quick ascent overheated the plane’s batteries, which store energy supplied by hair-thin solar cells that cover the top of the plane. The batteries could not be cooled enough during the long flight to prevent permanent damage. Now, after replacing the plane’s batteries and waiting for calm, sunny weather, the pilots are ready to resume their journey. Later in April, Piccard will make the four-day flight from Hawaii to North America, where, depending on the weather, he’ll land in Arizona or California or near the Canadian city of Vancouver. From there, he and Borschberg will continue across North America to Europe and finish their journey in Abu Dhabi this summer. Piccard answered some questions for KidsPost last weekend during an 18-hour flight above Hawaii to test the plane’s instruments before continuing the big trip. Solar cells work well enough to power a plane, but the plane needs to be extremely lightweight to conserve energy. The cabin fits just one pilot at a time, and there’s no room for baggage. The walls are thin and the plane isn’t pressurized, which means that the pilot has to dress like a mountaineer and wear an oxygen mask at high altitudes. Piccard says he was born for this kind of ad­ven­ture. His grandfather was a balloonist, and his father, Jacques Piccard, explored the deepest part of the ocean. “I remember very clearly saying to myself . . . that I also wanted to have that kind of life; the life of an explorer, interesting and useful,” he said. He made the first nonstop, round-the-world balloon flight in 1999. Soon after, he set his sights on a round-the-world solar flight and joined up with Borschberg. The flight is all about promoting cleaner, environmentally friendly technologies, he said, adding that using such devices as LED lamps and electric or hybrid vehicles “will make a big difference in the world” by helping conserve energy and resources. Flying for four or five days at a time with only occasional 20-minute naps can take a lot of focus. The plane weighs about as much as a small car but has the wingspan of a jetliner, making it very sensitive to wind and to little adjustments at the controls. “A few moments ago I saw hundreds of dolphins swimming in the water near the coast of Hawaii,” Piccard said. “It was so beautiful I got distracted and the airplane went outside its flight path for just a couple seconds.” An alarm rang in the cockpit, alerting him to make an adjustment so he would not lose control of the plane. Unfazed, Piccard tweaked the controls and flew on. The dolphins kept swimming.